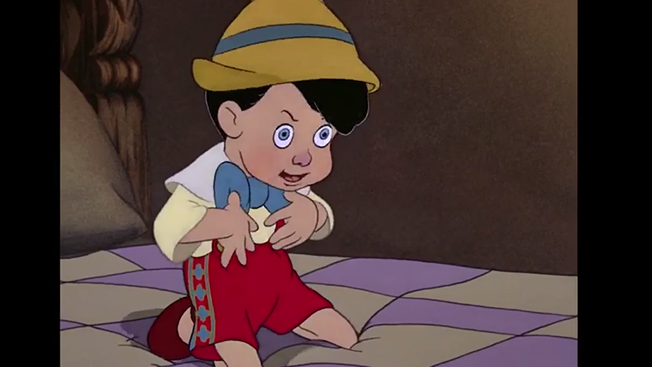 Late at night, when Wes Craven and David Cronenberg sit around trying to scare each other at the Horror Movie Directors' Spooky Mansion of Fear (look it up, it's a thing), I'm pretty sure the most frightening movie either of them can think of is Disney's disturbing 1940 classic, Pinocchio. A dark meditation on vice, morality, whale digestion and the human experience, Pinocchio is unsettling and bleak on a level you just don't see in modern movies aimed at kids. So it makes total sense that the ominous audio from the first Avengers: Age of Ultron trailer could be reworked seamlessly into a creeptastic teaser for Pinoccio, source of the "I've Got No Strings" tune intoned by James Spader as the villainous Ultron. Check out Nerd Reactor's sterling work on the mashup below, followed by the real trailer. Honestly, the mashup merely includes the top scariest moments. They don't even have the bit where the Coachman goes from kindly old weirdo to Satanic monster and his grin fills the frame. If anyone needs me, I'm under my desk.